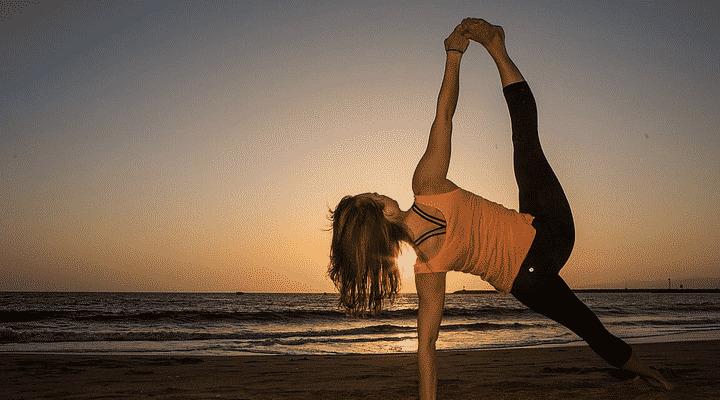 In this article I go over a daily morning exercise routine that I have found invaluable for keeping me feeling my best and my GI health the best that it can be. I wanted to share what I have found to be helpful so that others might hopefully see the same benefit. There is a huge difference between days when I have made time in my morning for stretching, yoga and drinking water first thing in the morning vs those days that I get lazy and take the morning off. I was recently interviewed as one of the guests on the Phoenix Helix podcast about exercise. I shared my story about how my daily exercise routine has been a huge component to what I currently do to keep my Crohn’s (and autoimmune disease more generally) under control. My morning yoga, hydration and stretching routine is something I had never written before here on the blog, so thought it might be worth elaborating on a bit. I thought I might provide some additional concrete details of my routine and suggestions for others, as there was limited time during the podcast interview to get into all the details of my daily routine. If you are working on coming up with your own exercise program that helps improve your symptoms and overall health, either with an autoimmune disease or just in your life in general, I hope my experiences and suggestions can provide a starting point to help figure out what works best for you own body and health situation. I have tried a number of types of exercise both before and after being diagnosed with IBD. In my viewpoint, exercise has always been helpful but was not enough to get my Crohn’s symptoms under control initially. But once diet helped me get my inflammation and autoimmune disease under control, exercise has helped tremendously with managing some of the day to day side effects of long term autoimmune disease and symptoms related to traditional medical treatments I have been exposed to over the years. In terms of the exercises you choose to do, that will depend on your own healing level, mobility, strength and flexibility. I personally don’t think anyone should push themselves too hard with these morning exercises as the main goal is to get yourself stretched out, get some blood flowing to all of your organs and get yourself moving. Instead of focussing on pushing yourself with the exercises, instead I find it helpful to concentrate on my breathing while doing each of the moves. You can push yourself to stay more present and focus on taking deeper breaths each day, which will often help you both improve your form in the exercise, helps you enjoy the morning routine and avoids pushing yourself past the point of comfort. This is particularly important if you have physical symptoms related to your autoimmune disease that you want to be careful not to exacerbate. Although I’ve found this exercise routing to be helpful at any time of the day. I believe it’s the most helpful if done when you first wake up in the morning. Drinking a couple of glasses of water and getting the blood flowing I find is a great way to get my body and brain up for the day, and a great alternative to coffee or caffeine if you are trying to reduce the amount you drink. I am typically quite dehydrated after a night of sleep, even if I was fairly hydrated the night before. Giving my body an infusion of water as the first thing in my day seems to go the furthest in countering any loss of hydration I had while sleeping. By following the routine first thing in the morning, it also allows you to fit it in before taking a shower for the day and before you have eaten your first meal, so you don’t have to worry about waiting until after you digest your breakfast before exercising. I find it’s a great routine to do first thing in the morning before heading to work, helping to naturally wake up. Below are the steps I follow in my own personal morning routine. I’d encourage you to try it out and then customize it to match your own needs. That said, I do think the early morning hydration and stretching of your body and organs in some form are critical components of why it is effective. I’ve been very happy with focusing on stretching/yoga types of exercises which tend to feel great and have been surprisingly effective on my level of both fitness and flexibility over time. I would try to aim for about 10-20 minutes of exercise time each day if possible, but really the most important thing is doing it consistently and doing something. So even if you can only spare 5 minutes for the exercise portion each day, then do that. After you finish the exercises, again drink a full 16+ once glass of water. This replenishes any hydration lost during the exercises as well as starts you off for the day hydrated. By drinking the water both before an after the exercises, it tends to be easier to drink the second glass as your body has had time to process the first glass of water. Again, drinking water is a critical part of this morning exercise routine for me, possibly even more critical than the exercises themselves. Although a bit more subtle than some of the Crohn’s symptoms I will mention below, now that I am pushing 40 years old I definitely am a little more prone to pulling muscles, straining my back, neck, etc when doing heavy lifting or intense exercise (such as carrying home the bulk amounts of food that I buy from farmers markets and health food stores and walking it back to my city apartment). I have noticed a huge improvement in my flexibility with doing these daily exercises, which seems to be preventative with some of these strains and injuries. I literally notice having more aches and pains if it’s been a day or two (such as a weekend) of not doing the morning exercise routine. I think this is somewhat related to the stretching and just feeling good from a morning of doing these exercises and stretching. The area that I see the most striking difference, and the reason I am so committed to this routine has to do with the contrast between days when I have done my full morning routine and those that I haven’t. One thing that has been a constant since first being diagnosed with IBD and even prior, is that my often fluctuating between times where I am constipated, times when I have cramping and then times where I have to rush to the bathroom. I can’t express the difference starting on the SCD diet and eventually Paleo has made for me in this area. I would say with being strict with my diet, I have been able to improve these issues 95% from where they were previously. But the morning exercise routine get’s me the other 5%. These days doing the morning routine just about guarantees me a day without cramping or having to worry about being near a bathroom. On days when I neglect to do the routine, I would say these symptoms might come up 30% of the time. If I’m going somewhere on a day that I need to make sure I’m feeling 100%, such as going somewhere remote like a hike, I make it a priority to set aside time that morning to do my full morning routine. One reason why getting the right balance of hydration and exercise has been so important for me personally, has to do with the history of my battle with Crohn’s disease. Although the inflammation from Crohn’s disease in my body appears to have subsided completely over the last several years due to strict adherence to a grain free, sugar free SCD and Palso compliant diet, I still have lingering side effects from years ago when my IBD was active. These residual symptoms, literally scars, from when my Crohn’s was at it’s worst cause the management of things like constipation a particular challenge for me. On the up side, I feel this is what has helped me to develop the exercise routine advice I am sharing here. Due to permanent scar tissue in my small intestine, my body is absolutely prone to these issues, whether active Crohn’s is present for me or not. Some of this is due to having surgery once already to remove a portion of my small intestine as the scar tissue had become so bad in that section. However, a lot of scar tissue returned as part of the healing process of that first surgery. So one option for me would be to have a second intestinal surgery done, but I personally would much rather manage these symptoms through diet and exercise. For a number of reasons, intestinal surgery is not something that I take lightly. The exercise routines laid out in this article are some of the steps that have proved helpful for me. If others have found exercises that have worked for them, please share them in the comments below. Everyone’s body and health issues tend to be slightly different so the more varied perspectives available, the stronger these resources are for our community. Chances are your tips and suggestions can help someone struggling to improve their health with autoimmune disease just as we all are in the beginning of this journey.